I really enjoy using everyday items to offer babies and toddlers fun activities. In a room filled with 18-month-olds, the period right after lunch can be quite hectic. Bickering is common and cleanup must therefore be expedited. Keeping children busy can help a great deal. Of course, if you turn around even just for a second, a child might grab hold of the broom you were using to sweep the floor. If a large broom falls on a child, he might get hurt. I am sure you can imagine yourself frantically saying, "Give me the broom, I need it to finish cleaning the floor!" As you know, children this age love imitating their early childhood educator. Simple imitation and role play games are great for helping children learn while having fun. 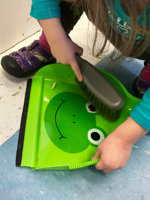 For this reason, I encourage you to provide tiny brooms and dustpans for the children in your group and use them to create a variety of simple workshops. 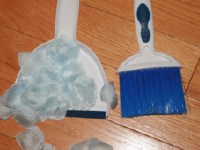 You can easily find tiny brooms and dustpans at your local dollar store. I suggest purchasing handheld brooms. Many dollar stores sell small toy brooms for little ones, but I feel the handheld brooms are easier for young children to manipulate. What's more, they are safer since they can't fall and hit a child on the head. Be sure to select lightweight dustpans too. Whenever you sweep the floor, after lunch for example, take out the tiny brooms and dustpans you purchased for your group. Set a garbage can on the floor, in the centre of the room, and invite children to help you pick the crumbs up off the floor. Of course, avoid offering the brooms and dustpans when the food on the floor is wet or sticky so you won't have to wash children's brooms and dustpans. Using your tiny brooms and dustpans for games can also be interesting. Before introducing this game, make sure both the floor and children's tools are clean. Collect several different containers such as boxes, buckets, or tiny garbage cans (they must be clean too). You will need a variety of elements children can pick up and deposit in the different containers. Every time you offer this workshop, provide a different type of element. You can, for example, explore items that roll, lightweight items, heavier items, etc. Changing the elements will make it possible to provide different levels of difficulty. Since this activity is presented as a workshop, let children fill and empty the containers as they see fit. At this age, children love repetition. If they remain interested, let them explore the material freely. 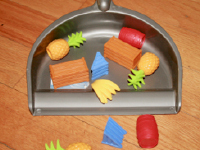 Use your tiny brooms and dustpans to make picking toys up off the floor interesting for little ones. Make sure the tools are clean and encourage children to use them to pick up blocks, figurines, or crayons. To maintain children's attraction for the tiny brooms and dustpans, let them use them in different locations, not just within your daycare walls. For example, children can use them in hallways or on an outdoor patio when the weather is nice.